"Look," the man says. "Look," the woman says. Their voices echo one another in the clean, white spaces of the Chelsea Art Museum galleries. The man (Tim Crouch) and the woman (Hannah Ringham) are our looking-glass guides into a journey through a broken love affair, a devastating illness, and a life-altering organ transplant that traverses London, Atlanta, the Netherlands and an un-named country in the Middle East. 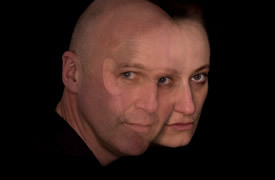 The play is England, written by Tim Crouch and presented as part of the Under the Radar Festival. England is a clear-eyed dissection of the transient, metaphorical, complex relationships forged between host bodies and guest bodies -- art and commerce, love and loss, and First World and Third World countries and languages. First performed at The Fruitmarket Gallery in Edinburgh in August 2007, it is a two-hander comprised of two slender acts that run for an hour without an interval. (There is a very short "breather," though, as audience moves from one location in the gallery to another.) In the first half, Crouch and Ringham (of the British troupe Shunt) act as lively faux-docents leading us through an exhibition of heartbreak. The current exhibition at the Chelsea Art Museum is "From Non-Conformism to Feminism: Russian Women Artists from the Kolodzei Art Foundation." Crouch and Ringham move among the audience seated there, exchanging voices as if within a single monologue that charts the relationship between a London woman and her Danish-American boyfriend, both nameless, over the course of a year when the woman is diagnosed with a severe heart problem. She will die if she does not receive a transplant. The couple is presented as upwardly mobile, relatively comfortable and fairly bourgeois. The boyfriend is an art dealer, and speculations and reflections on art pepper the opening half-hour as the monologue moves in and out of different states of consciousness and considerations of states of joy, ecstasy and suffering. Are we listening to the musings of the woman while she is in a possible (inferred but not directly revealed in the text) coma in the hospital, thinking back on her life in London and its intimate, quotidian and cherished moments? Or are we witness to an exteriorization of the internal dialectics of a couple -- in a One that is really Two? (In the second act, One figuratively embodies Two, after the woman has received a heart transplanted from a Muslim man.) Crouch keeps the guessing game alive in the first act as the slippery but precise strands of narrative fold into and around each other, braced by the echoing refrains shared by the couple: "Look. Look." Indeed, again and again, the piece demands of its audience-witnesses, in a genial but provocative manner: "Look at this story. Look at how it is told. Look at the space we're in together. What do we look at when we look?" Bert States in Great Reckonings in Little Rooms (1985) states: "In the theater, image and object, pretense and pretender, sign-vehicle and content, draw unusually close. Or as Peter Handke put it, in the theater light is brightness pretending to be other brightness, a chair is a chair pretending to be another chair." In England, the gallery at the Chelsea Art Museum is a gallery pretending to be another gallery: the gallery of someone's mind and body. The arteries of feeling that rush through the compact piece are full. The muscles of its contours are taut. The piece is extraordinarily moving, and yet Crouch does not beg for empathy. His approach, as in his previous pieces My Arm and An Oak Tree, is warily warm, open but distant. His manner is self-effacing and the language of his work is direct and on the surface, deceptively simple, but the layers of narrative strands he orchestrates on the page and in performance are rigorous, complicated, and cut as hard as a diamond. England, which is co-directed by Karl James and a smith (written that way), radiates refracted light that comes at us through the opaque face of a self blown apart by illness and loss, and in the second half by a self unknown to itself. As the audience sits down in folding chairs facing a white wall in a lower-level space of the museum, the play's second half presents the supposedly recovered woman gone halfway across the world to meet the wife of the dead man whose heart she now carries. The English woman (enacted by Crouch) is alone with an interpreter (played by Ringham). The Muslim woman is unseen and her language is unknown and heard only in translation. The art-dealer boyfriend is barely mentioned, but it becomes clear through sly hints in the narrative that the relationship with him has failed. Illness and perhaps the transplant itself caused an irreparable rift. The English woman was left with an art piece they both loved: a DeKooning print, perhaps, although it may also be one of the other pieces named in the first half of the piece as part of their jointly held "unofficial" collection. In any case, what we see--and what we look at in our mind's eye--is a woman who has traveled at great cost to an unknown city to meet a person from whom she desires spiritual solace. In effect, the woman believes that if this other person were to look at her ("Look. Look.") then perhaps a bond of healing and resolution could be forged. They could understand each other and perhaps even exchange gifts. But the transaction that the English woman seeks is unfulfilled. For the Muslim woman cannot look at her and see her. She sees only the damage done to her husband, who was "murdered" by a system that valued his organs more than his life. As language falters and fails, as translation proves inadequate, the two women are left inside an unanswered question. "Look." But what do we see? And moreover, what can we see in a mediatized world where images of Others are filtered through veils of difference that hinder true understanding and communication? Inside a lexicon of failure--failed utterances, failed bodies, failed and foiled transactions, collapsing words, and wounded hearts--England questions how a colonizing body wrests the objectivity of narrative from a subjected Other. The English woman in the first half leads a quiet, unassuming life of privilege. The DeKooning print matters to her and her boyfriend because it's beautiful, yes, but moreover because of what it's worth and what it will be worth over time. The value of art and the value of life are intertwined as the woman tries to find meaning in the spiritual gifts that art can offer, but the society in which she lives offers little space for that meaning to be revealed. 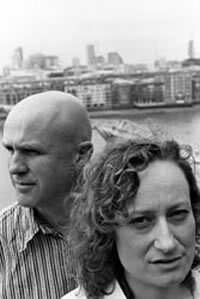 The co-directors (who also co-directed Crouch's An Oak Tree) have crafted a singular performance experience with this site-responsive play for galleries. While the published text includes references to The Fruitmarket Gallery where the piece originally premiered, it is clear that each performance must take into account the history, architecture and sonic reverberations of the new site where it plays. There are open spaces in the published text for such insertions and reconsiderations. The spectator is central to the way the piece operates as theater. Crouch and Ringham are at first interspersed casually among the standing audience that awaits the piece's beginning. They speak from the crowd and refer to whatever physical obstructions are in the space as they welcome the audience to the piece. They are tour guides of sorts to a tour that has no clear destination. The piece moves from this genial prologue into four discreet movements where the performers play alongside pieces currently in the exhibition (in this case artworks and photographs in the "From Non-Conformism to Feminism" exhibit) and the audience is surrounded by the art. The spectator is guided gently but the signs of each movement aren't necessarily obvious. Each movement corresponds to a shift in the audience's perspective. There are marked silences in each, and also an undulating, rippling, sound-scape (designed by Dan Jones) that emanates mysteriously from the performance space -- at turns ambient and minimal and at others threateningly loud and ominous. Although Crouch and Ringham are highly skilled, inviting and compelling performers and act well as "hosts" to the "guest" bodies of the story -- the spectators -- the narrative is often quite internalized and thus unsuited to the usual performance circumstance. This is not an event happening before you, although it seems to be, because it is a play, after all, but rather an explication of an event that is past. We as audience are witness to an aftermath of someone else's experience, and we're left to wrestle with the varying encounters we've had with it. Crouch plays both the boyfriend and the girlfriend at several points in the narrative, and likewise so does Ringham. Identity therefore is unstable. The borders between the personal narratives bleed. Whom are we to believe? To whom should we look? Who gets to tell the story, in other words? And during the second act, as we sit in our folding chairs as a presumably coherent group, occupying the space where the Muslim woman is placed, what voice do we have to reply with? And how do we interpret what we see? The last words of the piece are, "What's she saying? What did she say? What did she say?" The English woman is bereft, struggling and distraught in the inexplicable dilemma which the transplant -- and the transplantation and re-translation of cultures -- has left her. As spectators, we too are left to ask, "What did she say?" and perhaps begin to craft in our own minds the narrative of the Other that is not privileged in Western storytelling and reportage. What words do we use to break down the borders between us? What new languages need to rise up and where do the sites of these new narratives exist in the fallout of Empire(s)? Is England Crouch's subtle indictment of England's blinkered view of the non-Western world? What spaces are seen as we look? What spaces do we choose not to see when we look? "Who are we, if not a combinatorial of experiences, information, books we have read, things imagined? Each life is an encyclopedia, a library, an inventory of objects, a series of styles," states Italo Calvino in Six Memos for the Next Millennium. The life of a space, of a body, of a country -- its Here -- speaks, even before a word is spoken. The living architecture of a space and its history offers visual, aural and textual information. In England, the woman and the boyfriend inhabit a constantly flowing transatlantic space of shared values. Their bodies are joined in a loose inventory of seeing and ways of seeing. When the woman's body -- her site of action -- unravels, the potentialities of the inventory which is her life shift radically and force her to another state of being and another way of thinking about and rendering culture. The external theater derails and suddenly the internal detailing of the interior theater emerges. In Crouch's interior theater--both the amusing, reflective, moving, sharp recollections in the first half and the inchoate seeking of expressiveness in the second--England is a torn self that has barely even begun to really look at itself, despite its insistent demand to be seen.